Achieving the highest possible welfare standards for their pigs is the ultimate ambition for two sisters in East Yorkshire. Chloe Palmer learns more. A career in pigs was not on the cards for sisters Vicky Scott and Kate Moore, despite growing up in an East Yorkshire family already renowned for a successful pig enterprise. Their parents, David and Sue Morgan, created a thriving business from nothing after Mr Morgan worked as a farm manager on many different farms and then contract farmed at Wykeham Estates for five years. In 1996 the family returned to East Yorkshire and bought a small farm, deciding pigs were the best option to make a living. They started the business with 800 breeding sows and selling the progeny as weaners. Mr Morgan’s three daughters, Vicky, Rachel and Kate showed little interest in the pigs for all of their teenage years. Even after all three daughters graduated with degrees in a subject connected to agriculture, all went off to take unrelated jobs and travel initially. Mrs Scott was the first to return to the farm after her father asked her if she would come back to help while they were short-staffed. “I spent much of my first few years mucking out and power washing, but learnt a lot and gained a sound understanding of pig production,” she says. Mrs Moore went to work for a food company after graduation and realised she hated working in an office so chose to go travelling for several months, before eventually coming home in 2008 and joining the family business. At this point there were 1,200 sows on-farm and shortly afterwards a planned programme of expansion quickly came to a halt as the recession hit. Now the business comprises an indoor breeding unit at Pockthorpe Hall, near Driffield, which houses 1,700 sows and an outdoor unit at East Knapton where there are 1,200 outdoor sows. The sisters place the highest standards of pig welfare at the heart of everything they do. Their ethos has found them favour with their principal customer, Sainsbury’s. Mrs Scott says: “In 2008, Sainsbury’s came to us to talk about its 20:20 vision for animal welfare and it was this discussion which led to our investment in the free farrowing system. The free farrowing system allows the sows to rear and suckle their piglets without the restriction of a crate, but it is carefully designed so the risk of the sow lying on and potentially crushing the piglets is minimised. The sows have ample room to move around and are provided with straw prior to farrowing so they can exhibit their natural behaviours of burrowing and nest building. 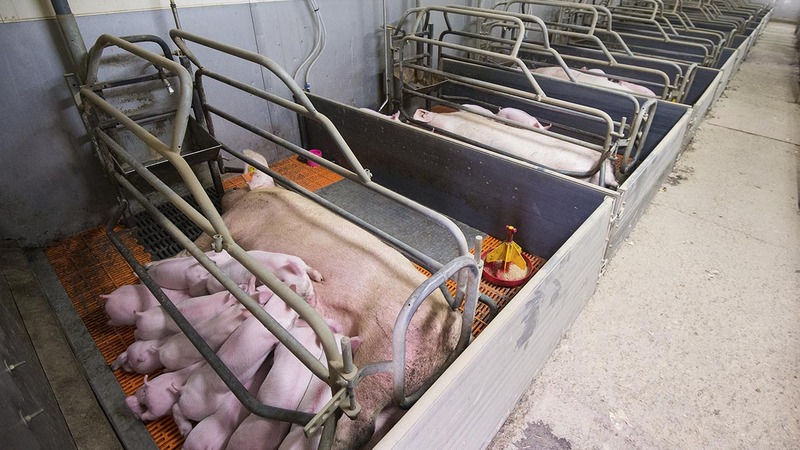 Provision is made in the design for a safe creep environment for the piglets where they can retreat to sleep. After six years of use of the free farrowing system, Mrs Scott says their observations of the sows and gilts suggest they do not always react as expected to their new found freedom. “When we first placed the sows into the free farrowing unit, they did not all adjust well to it. It was completely different to a traditional crate and some of the older sows found the whole experience completely alien. 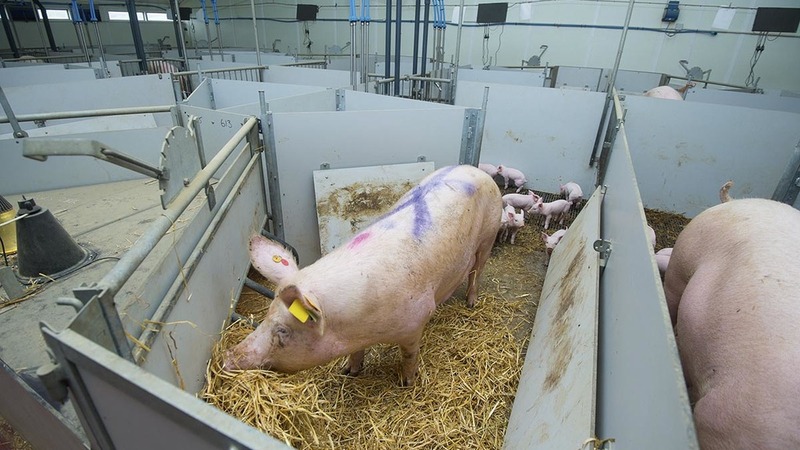 The free farrowing system is just one element of the comprehensive approach to ensuring the pigs produced by Pockmor have the best possible life, according to Mrs Moore. 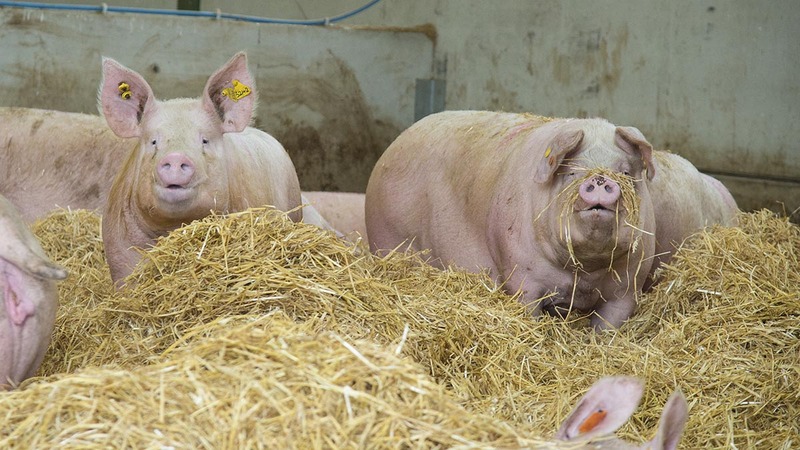 “Currently, 98 per cent of our pigs are weaned into indoor straw yards or are reared outdoors. This is how we want to produce pigs. However, the market will not pay a premium for indoor pigs produced on straw, so we have recently constructed a slatted building for finishing 2,000 pigs at any one time. “This is not how we want to do things but the market is forcing us down this route because we cannot compete with pigs produced on slatted systems. 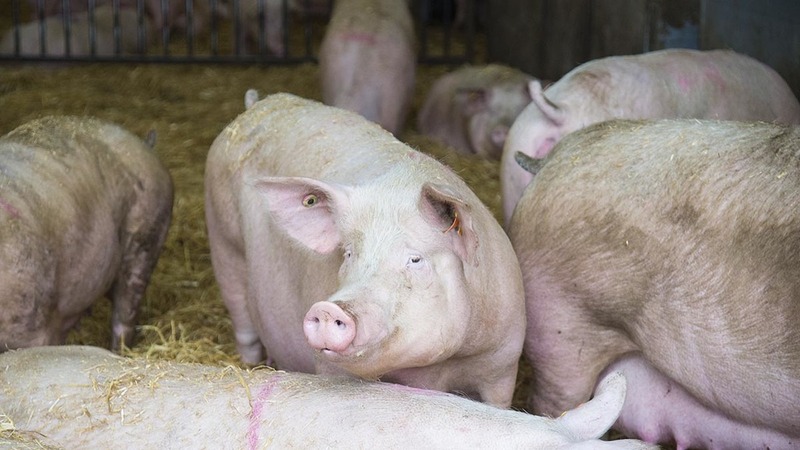 There are additional costs associated with finishing pigs on straw and they do not achieve the same daily liveweight gain or feed conversion rate on straw compared to slats. As part of their commitment to the highest health status for their pigs, the sisters take every measure possible to minimise the use of antibiotics within their systems. The outdoor pigs are antibiotic-free and the indoor pigs are only treated with antibiotics when it is absolutely necessary. “We have always used very few antibiotics and have not used in-feed medication for over a year now. We maintain the highest standards of biosecurity and I think this is what has helped to keep our pigs healthy for 20 years,” Mrs Moore adds. Correct nutrition obviously plays a vital part in maintaining the efficiency of the business and Pockmor owns and runs a mill nearby which gives the family complete control over the ration they feed. Mrs Moore says: “We try and buy all our wheat and barley locally, and where possible, we will collect grain from the same farmers who finish our pigs so we can supply their home-grown feed back to them. Mrs Scott and Are Moore admit their father’s passion for figures has meant they have a head start when examining the financial performance of their business. “Dad has a very strong business head and we have information about every pig we have ever sold. This is why we are still in business because we have figures on the price we have received for each one and we know the costs of everything. “It means when times are tough, we know what we can focus on to improve our efficiency even further,” Mrs Moore says. Recruiting the right team of people has been a challenge but their efforts have paid off; Mrs Scott describes the business as ‘very fortunate’ to now have an established team of 20 staff who she rates as ‘excellent’. Despite striving to minimise costs and maximise performance, the sisters still place welfare at the very top of their priority list. “The way we treat our pigs makes a massive difference to how they perform. We also have a fantastic team of staff who share our ethos when working with our pigs,” Mrs Moore says. Mrs Scott agrees, admitting she finds it hard to put commercial considerations first. All gilts are bought-in at 180 days old when they are almost ready for first service. Gilts for the indoor unit are bought from JSR Genetics and gilts for the outdoor unit are sourced from Rattlerow Farms. Piglets are weaned at 28 days on both units and are finished at either one of Pockmor’s own two indoor weaning and finishing sites, or they are sent away to one of their 30 ‘bed and breakfast’ farmers. Pigs are weaned each Wednesday in the indoor unit and the sows are then served on a Sunday. For the outdoor unit, weaning takes place on a Thursday and the sows are served in an outdoor service tent on a Monday. The dam line is Large White cross Landrace. The sire line is changed periodically to ensure the business can take advantage of the genetics available.